How to Build a Plane While Flying It through a Storm"
Kayvon Modjarrad, M.D., Ph.D. is an infectious diseases physician, epidemiologist and immunologist. He holds the positions of Director for Emerging Infectious Disease Threats at the Walter Reed Army Institute of Research and Associate Professor of Medicine at the Uniformed Services University of Health Sciences. After obtaining his undergraduate degree in biology from Duke University, Dr. Modjarrad obtained his MD, MSPH and PhD through the NIH-funded Medical Scientist Training Program at the University of Alabama at Birmingham Schools of Medicine and Public Health. He completed his medical internship at Yale-New Haven Hospital and his internal medicine residency and clinical infectious diseases fellowship at Vanderbilt University School of Medicine. He went on to complete an infectious diseases research fellowship at the National Institute of Allergy and Infectious Diseases Vaccine Research Center, where he also held the position of Chief of the Translational Research Core. In 2015, Dr. Modjarrad was sent on assignment from the US Government to the World Health Organization where he assisted with the response to the West African Ebola Outbreak. Dr. Modjarrad’s work primarily focuses on the accelerated development of vaccines against viruses—such as Ebola and Zika—that have triggered global health emergencies. Dr. Modjarrad was one of the first research fellows at the Vanderbilt Institute for Global Health. During his year at VIGH, Dr. Modjarrad worked to build up student training opportunities and mentored multiple medical students while he pursued his research on HIV co-infections. His career trajectory began under the mentorship of Dr. Sten Vermund and has continued on a course toward global infectious disease mitigation ever since. 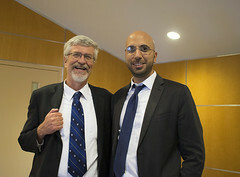 Established in 2006 with the creation of a chair in global health (named after Dr. Amos Christie, former chairman of pediatrics at Vanderbilt University Medical Center), Dr. Sten Vermund was appointed as the first Director of the newly formed Vanderbilt Institute for Global Health (VIGH). A prominent global health expert, Dr. Vermund gave Vanderbilt an international presence as a leader in global health. During his tenure, he developed a significant and sustainable portfolio of research, education and clinical service programs giving VIGH the foundation on which to build an even better future. Dr. Vermund played a key role in creating collaborations and interdisciplinary programs to improve health. Today the institute has 15 core faculty, 81 affiliated faculty, approximately 100 annual student and trainee engagements, and over $100 million in funding in more than 15 countries, with a strong presence in low- and middle-income countries (LMICs). Although he left VIGH in February 2017 to become Dean of the Yale School of Public Health, Dr. Vermund’s vision and passion for global health left a lasting impression on his students, colleagues, and friends at Vanderbilt and beyond. A reception honoring Dr. Vermund will be held after the Global Health Symposium at Vanderbilt. VIGH maintains a strong commitment to innovative and collaborative interdisciplinary programs that promote health worldwide. Join us to learn more about the impact of our work from those leading the way. 12 :00 – 1:30 p.m.